For the 10th year in a row, the New England Patriots Alumni Club would like to welcome you to partake in its annual Stars & Stripers Fishing Tournament, an entire day dedicated to fishing, food, friends, and hanging with current and former New England Patriots in attendance. Participants will have the opportunity to hit Cape Cod waters, competing for the longest Striper or Blue fish. During this year’s BBQ dinner, enter to win some fan favorite raffle items. All Funds raised from this tournament will help support our mission of giving back to the communities in New England. 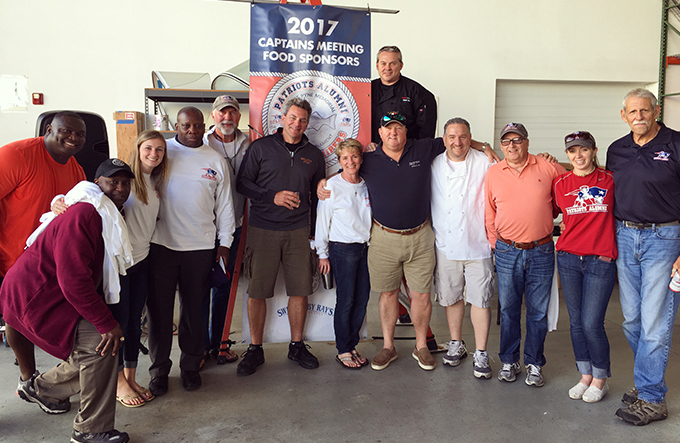 We have three categories you can choose to participate in this year’s 10th annual catch & release Stars & Stripers Fishing Tournament. Sponsorships available, click here to learn more. Overview: After picking up your materials from MacDougalls’, you and a friend are unleashed to find your hotspot location for Fly Fishing anywhere on the Cape. Come back around 3:30pm for hors d’oeuvres, music, & mingling with current / former Patriots in attendance. Stick around for awards, dinner, and fan favorite raffle items. Overview: Join the fleet of boats in this year’s tournament then meet up with Alumni & Current Patriots Players / Coaches in attendance back at MacDougalls’. Indulge in the raw bar appetizers while listening to some music dockside before heading into the hanger for finger-licking-good BBQ. Funds raised help support our mission ‘to provide an opportunity for former Patriot players to remain actively involved with each other, the Patriots organization, and the community by supporting and funding youth football throughout New England with programs that emphasize leadership, teamwork and achievement through lessons learned on the football ﬁeld’.